What to do if I get a "Please check your Internet connection" message? If you are using an older version of macOS, please visit our Minimum requirements page to see if your OS version is supported by Dashlane. To install Dashlane, you can either download it directly from our website or you can open the Mac App Store and install Dashlane from there. If you choose to install it from the Mac App Store, there are two steps to installing Dashlane on your computer. Open the App Store from the menu bar. Then search for Dashlane and install it. Note that the Dashlane application is always free on the Mac App Store, even when reinstalling or updating. If you see a Buy button instead of Install or Get, click it and it will install or update Dashlane for free. If you have a Premium subscription for your Dashlane account, you will not be charged again when installing or reinstalling from the Mac App Store. Your subscription is linked to your Dashlane account and not directly to the application. You will have to sign in with your Apple ID and password to download Dashlane from the Mac App Store. 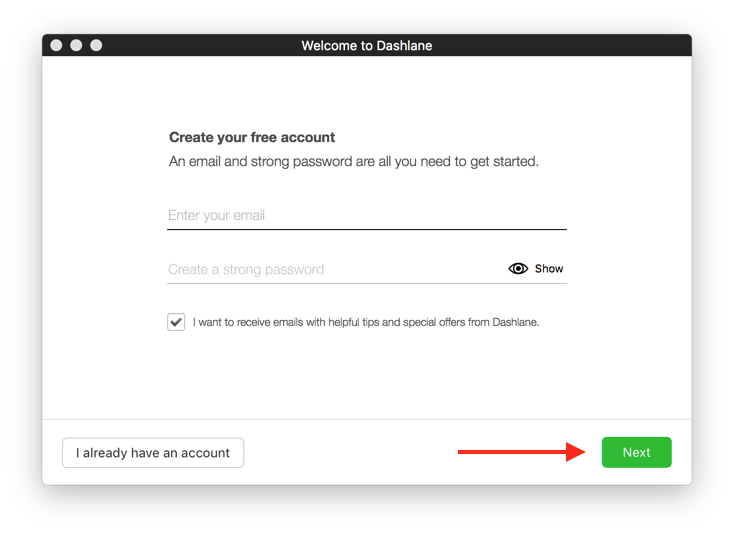 When Dashlane is installed, open the Dashlane application from your Dock or Launchpad and create a new Dashlane account (or log in to your already existing Dashlane account with your registered e-mail address and Master Password). If you create an account, make sure that you remember your Master Password – for security reasons, we will not be able to send you a new one! After creating a new account, you will see several introduction windows. Click on Next at the bottom right to move through all of these. If you have been storing your passwords in your browser, then one of the windows will let you choose and import the passwords stored in your browsers. You can skip this step if you like, but we recommend that you do not store your passwords in your browsers since doing this is not secure. 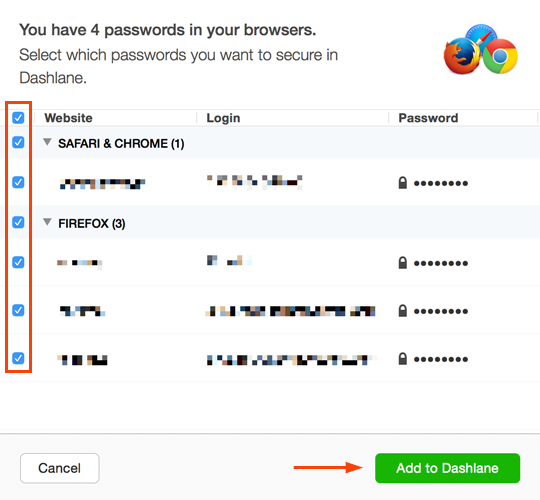 Note that importing your passwords from your browsers to Dashlane might create duplicates if you have the same login stored on several different browsers. Outdated logins might also be imported. Make sure you uncheck any passwords that you don't want to import into Dashlane, though you will be able to clean this up later in Dashlane. Click on Import. After you install Dashlane, your system's default browser will open and automatically show you the installation page for the Dashlane extension. Follow the steps and click the green button Add it now. Finish set up! 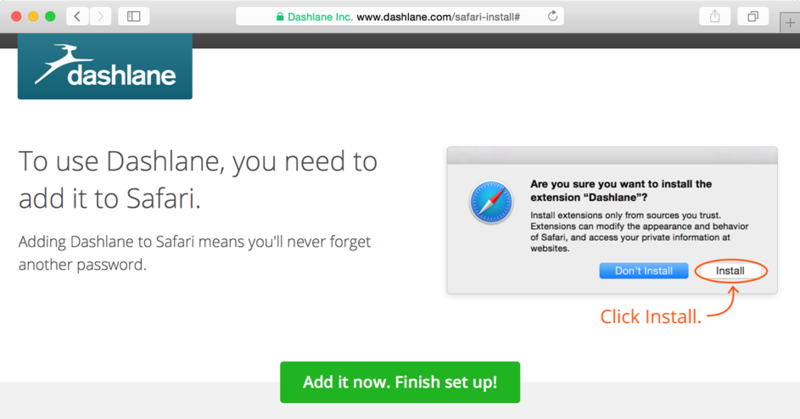 to download and install the Dashlane extension in your favorite browser. If you do not wish to install Dashlane in this browser, simply close the tab and confirm you want to leave the page. Also make sure that the tab is not reopened automatically by your browser after you quit it. If you prefer to install the Dashlane extension manually or in other browsers, open the Dashlane application and select Dashlane > Install Browser Extensions in the menu bar at the top of the screen and choose your favorite browser here. A new tab will open in this browser to install the Dashlane extension. Click the green button Add it now. Finish set up! on that page and confirm you want to install our extension in your browser. If you cannot find the tab, please check your open tabs or follow this guide: How do I enable Dashlane in my browser? The Dashlane extension will be downloaded and installed in this browser and it will pop up in your browser toolbar. Make sure you see the Dashlane icon in your browser toolbar: it must be green on Chrome and Firefox and black on Safari. If the icon is grey instead, then first check that you are signed in to your account in Dashlane, and refer to this page: How do I enable Dashlane in my browser? When installing the Safari extension, a page will open in Safari. Click on Install it now. Then click on Install to confirm you want to install the extension in Safari. The Dashlane icon will pop up in your browser toolbar, showing that the extension has been properly installed and is now active. When you open up Firefox for the first time, you will see the installation page for the Dashlane extension. In your browser toolbar, a pop-up will warn you that Firefox blocked the installation. Click Allow to authorize the installation of the extension. Then click on Install now on the second window to confirm. If you don't see this screen, please check your open tabs or follow this guide: How do I enable Dashlane in my browser? 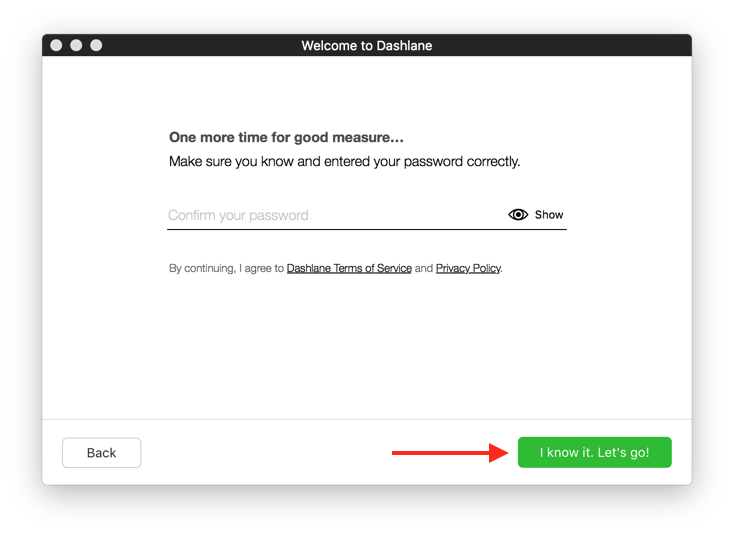 If you are running macOS Mavericks 10.9.0, 10.9.1, 10.9.2 or 10.9.3, there is unfortunately a small bug that keeps Dashlane from working on these versions. Please update your OS to the latest version of Mavericks (OS X 10.9.5) or to more recent versions, which is free. More information here: Upgrade OS X. Open Safari and select Safari > Preferences in the menu bar at the top of the screen. Then select the Extensions panel and select Dashlane in the list and tick the box that says Enable Dashlane. A new page will open in Safari (if it doesn't open, please click here and open this page in Safari); click on Add it now. Finish set up! Click Install to confirm you want to install the extension in Safari. If you have a Free account and if your account is not Premium, open the Dashlane application and select File > Export Data > Dashlane Secure Archive… in the menu bar at the top of the screen. Save this file somewhere onto your hard drive. If anything goes wrong, you can still import this file back into Dashlane to recover your data. 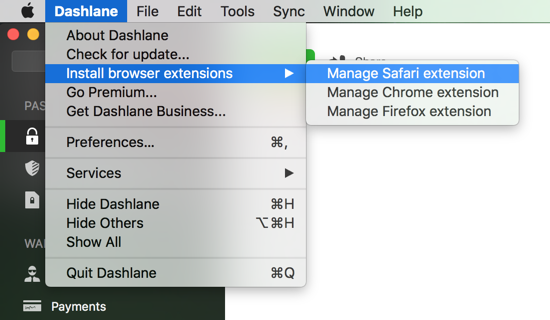 In Dashlane, uninstall all the browser extensions by selecting Dashlane > Install browser extensions in the menu bar at the top of the screen, then click on "manage" for each browser for which you've installed the Dashlane extension, and follow the provided instructions. 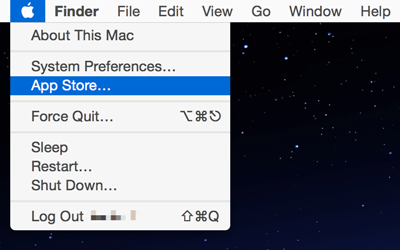 Quit all browsers and quit Dashlane (using ⌘ / Command + Q). Then go to Launchpad and click and hold on Dashlane until you see a little cross in the top left corner of the icon. Click on this to delete the application. Now go to your /Applications folder on your hard drive using the Finder and move the Dashlane application (if any) to the Trash. Lastly, download and install Dashlane again here. If Dashlane still does not work in your browsers, please open the Console application located in your /Applications/Utilities folder on your hard drive and check if there are any errors there.